Bordeaux 2017 will go down as the year of the frost. But now that the harvest is complete, it’s clear that this really is a vintage of haves, have-nots and somewhere-in-betweens. For those growers and châteaux with vineyards that weren’t hit, there has been every chance of making very good wine. 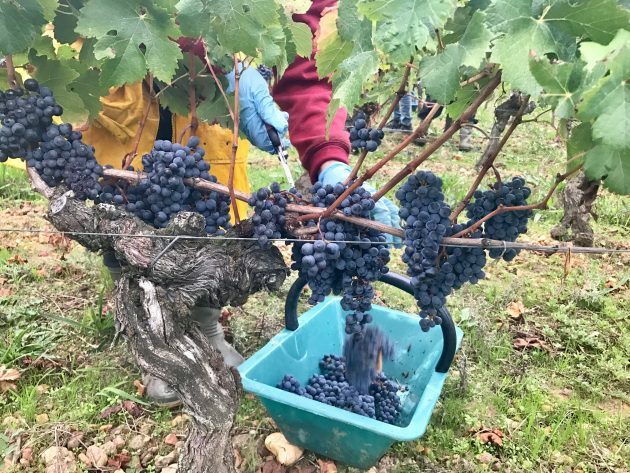 Here is a look at how the weather stamped an indelible mark on the vintage, along with numerous images of the harvest. 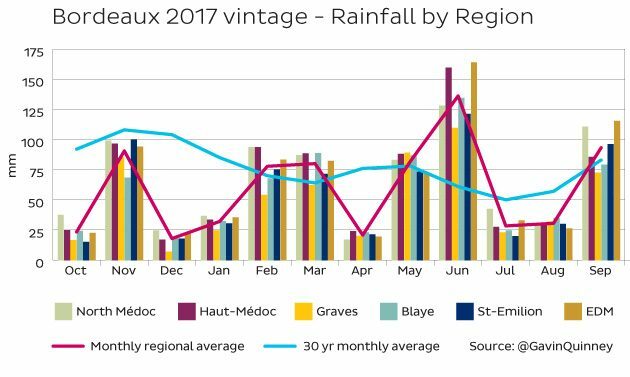 The most obvious point about Bordeaux 2017 is that production overall is down a staggering 40-50%: the late Spring frost – primarily the one in the early hours of 27 April – severely damaged the young buds, shoots and tiny unformed bunches at the very start of the growing season. 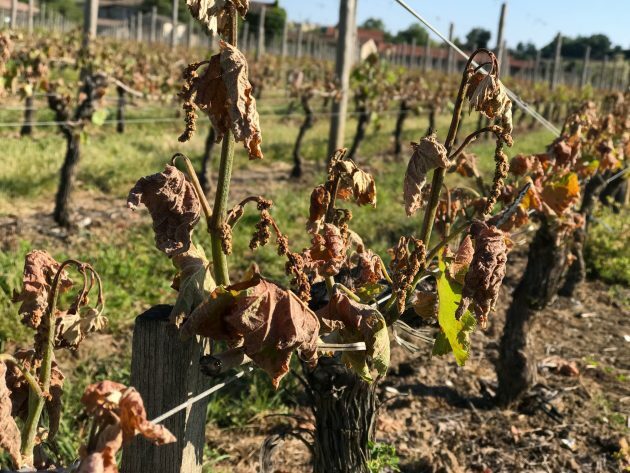 Bordeaux hasn’t experienced anything like this level of frost damage since 1991. 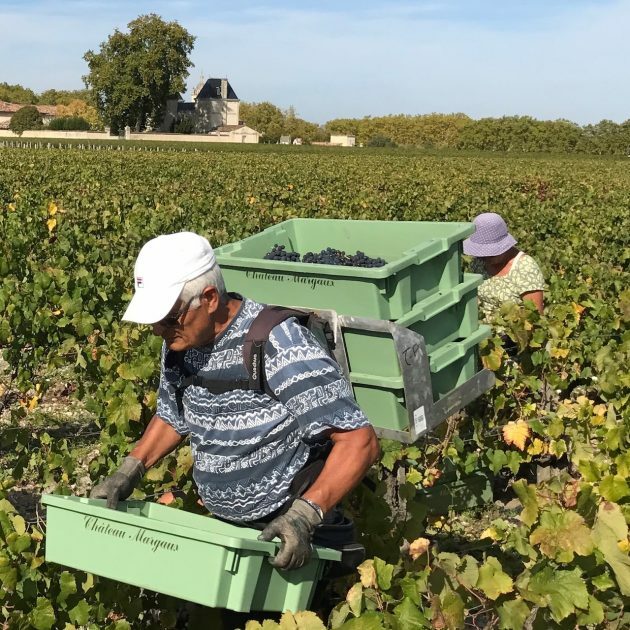 The losses are by no means evenly distributed, so everyone has had different challenges and opportunities: some growers and châteaux lost their entire potential crop for the year; some, like us, around half; others suffered no losses at all. This month, every grower or producer is required to submit their déclaration de récolte, or crop declaration, and it won’t be a joyful exercise for many. The figures for each appellation will be published in February. 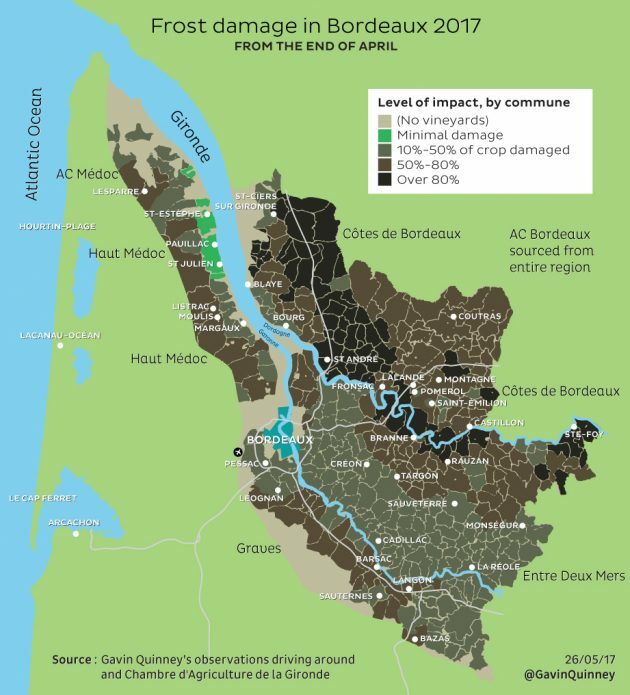 Some areas fared much better than others – in May, I created an exciting frost map of Bordeaux 2017 which you can find in the appendix at the foot of the page. It’s not just about the frost. 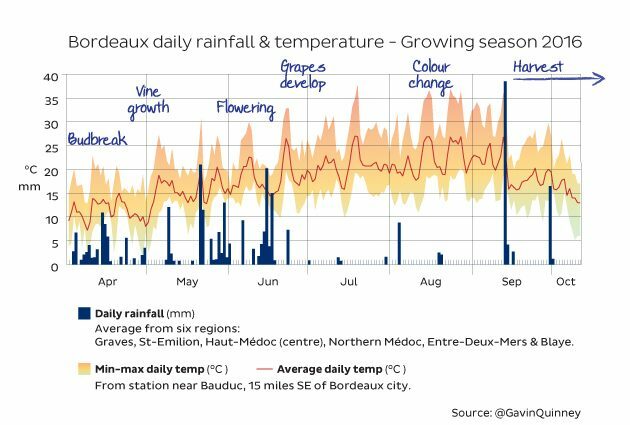 I’ve put together the daily temperature and rainfall statistics for 2017 from six different regions across Bordeaux. After an early bud break, 2017 was always likely to see an early harvest, despite the Spring frost. The flowering began in mid-May and was not affected by the heavy rain at the end of June (the week after the blistering heat of Vinexpo). July was mixed – sometimes sunny but often cloudy and mild. Veraison, when the grapes change colour, began relatively early. We then enjoyed a fairly hot and dry August. 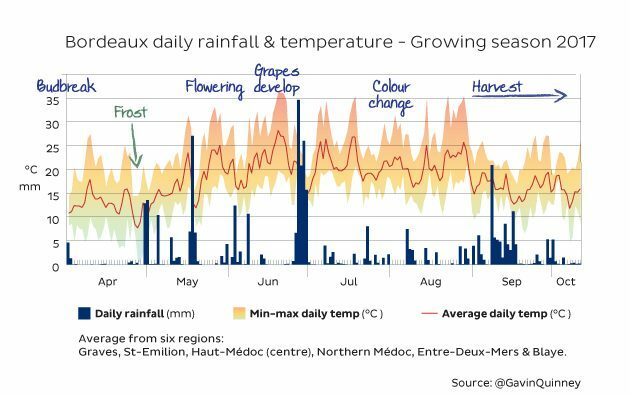 Rain during the first half of September was initially welcome after the hot patch but when it carried on, along with the falling temperatures, there was serious concern in the build up to the red harvest. Thankfully, the sun came out for the second half of the month and the threat of rot or dilution receded. Most châteaux completed the harvest in September, while others waited for their Cabernets a little longer. 2017 was a dry vintage when taking into account the 12-month cycle; we had around 700mm of rain for the year, compared to a 30-year average of over 900mm. There was a similar amount of rain from March to September as the 30-year average. Comparing 2017 with other years, June and September were wetter than the average, while July and August were drier. As we saw above though, the heavy rain at the end of June had minimal impact on the flowering. There are more fascinating weather charts and observations in the appendix below. Now to turn to some impressions of the harvest around Bordeaux. For enthusiasts, buyers and collectors of fine wine, it’s first worth noting that 80% of the top 150 châteaux enjoyed a good harvest; there was minimal damage to the plots which provide the grapes for their first wine or ‘grand vin’. So, at the top end, there should be reasonable volumes, and good quality, from many of the blue chip names. A good number of the top 150 châteaux are in Pauillac, St-Julien and St-Estèphe, and their vineyards, profiting from the benign influence of the Gironde estuary alongside, were mostly unaffected. Further south on the Left Bank, although Margaux, Pessac-Léognan and Sauternes saw some serious frost damage, the best parcels for most of the top names survived intact. On the Right Bank, St-Emilion suffered terribly as a whole but many of the top estates, especially those with elevated vineyards, had far less damage than those on the plains below. The same was true for the top vineyards on the plateau of Pomerol. Though these seven famous appellations make up just 13% of the total area of Bordeaux (14,300 hectares out of 110,000 in all, and St-Emilion accounts for almost half of these), they are home to nearly all of the most famous names. Frost? What frost? 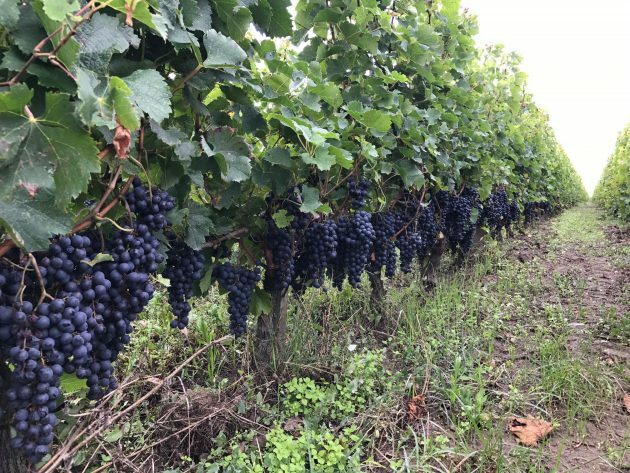 The vintage looks very promising for the key appellations of Pauillac, St-Estèphe and St-Julien. With one or two exceptions, these were generally untouched by the frost. 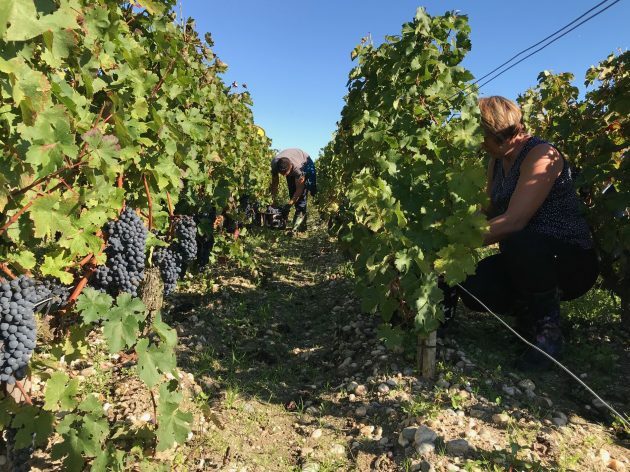 The Cabernet Sauvignon looks especially good and although many châteaux completed their harvest in late September, the fine weather in the last fortnight of the month gave châteaux the opportunity to hang on until the first week of October if needed. Château Lagrange in St-Julien was one of the few Grands Crus Classés in the northern end of the Haut-Médoc to have suffered some serious frost damage. It is no coincidence that of all the St-Julien Crus Classés, it’s the furthest inland from the estuary. Just across the appellation boundary, the Crus Classés of the Haut-Médoc – Châteaux Belgrave, de Camensac and La Tour Carnet, were all hit. Château Lagrange, St-Julien. Tasting the 2017s – and comparing frost damage notes – with director Matthieu Bordes. 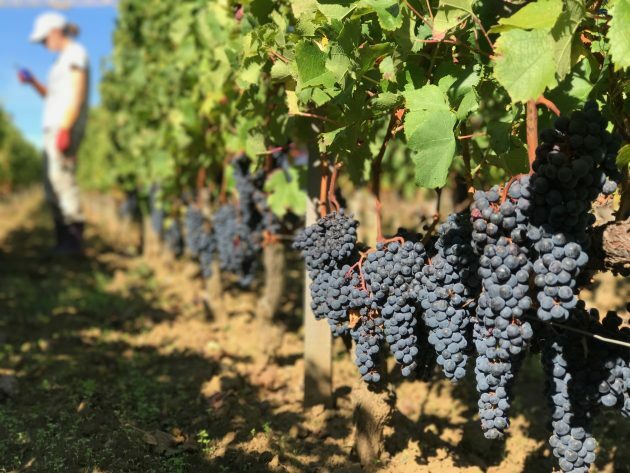 Cabernet Sauvignon harvest, Château Margaux, September 2017. 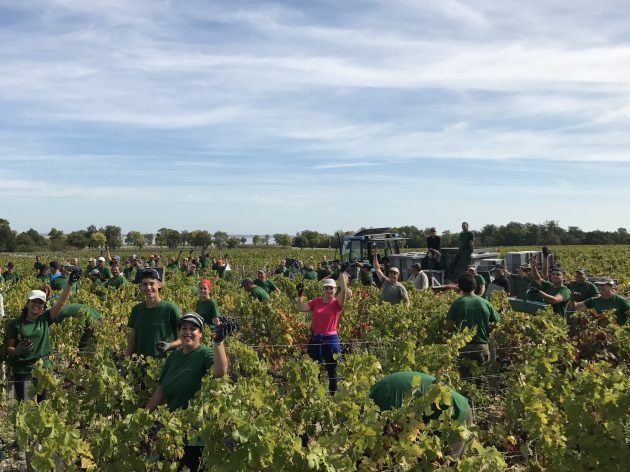 South of the city of Bordeaux, it was a mixed vintage for Péssac-Léognan and the Graves, with fine harvest conditions for those parcels that weren’t damaged. A team from Château Chantegrive inspecting hail damage. La Maison de Graves vineyard, Podensac, 27 August 2017. 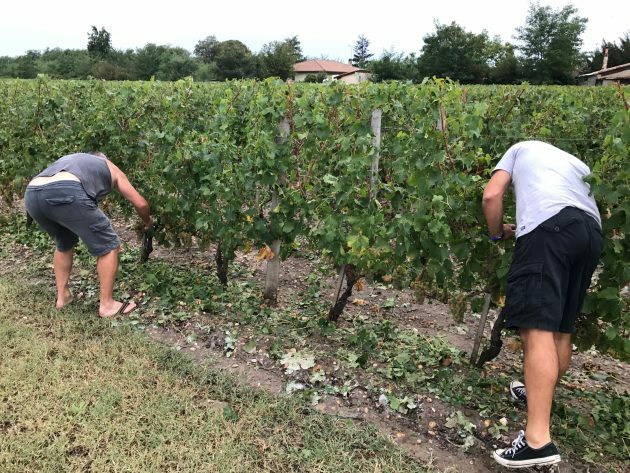 Harvest conditions for the sweet white wines of Sauternes were also really encouraging, although I haven’t been down there since the summer. Lower lying vineyards there had been hit by the frost, and parts of Barsac were severely damaged. 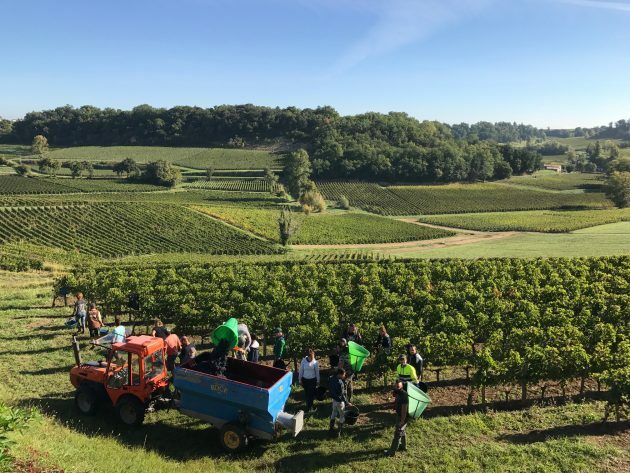 Throughout the 2017 growing season and during the harvest, nowhere demonstrated the contrast between the vineyards that were damaged by the frost, and the vineyards that weren’t, more than St-Emilion. 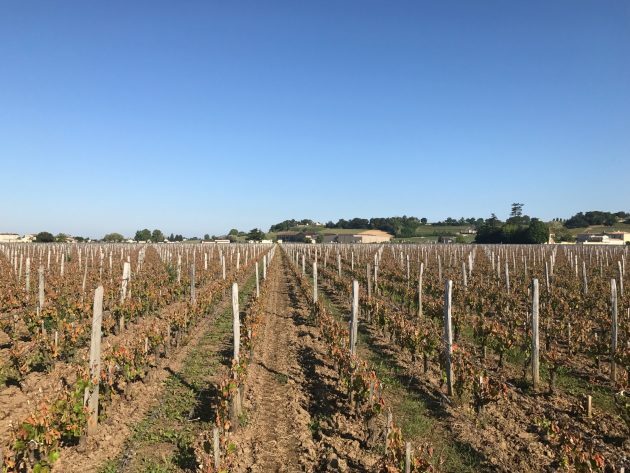 This large region of over 6,300 hectares – the appellation is bigger than Margaux, St-Julien, Pauillac and St-Estèphe combined – has numerous differing terroirs and varying landscapes. 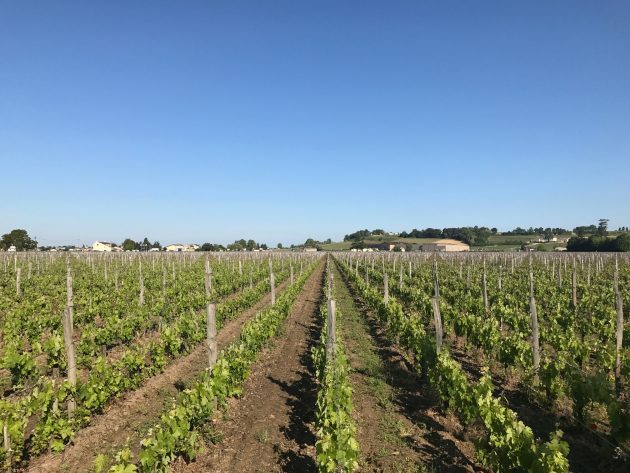 In 2017, both St-Emilion and its satellites, notably Montagne-St-Emilion, saw some of the worst of the frost damage. Prestigious properties weren’t spared either, and several Grand Crus Classés suffered considerable losses of up to 100%. Certainly the leading vineyards on the limestone slopes and the plateau surrounding the town itself fared well, with absolutely minimal damage. Touring around these vineyards in August, from Château Canon across to Château Troplong Mondot, above, you’d be forgiven for thinking that St-Emilion was enjoying a bumper crop. A grower in St-Emilion arriving at the co-operative there with just 5% of his normal crop. September 2017. In other parts though, not least down on the valley floor, the full force of the frost had been felt. And yet some parcels were hit, while others weren’t. The way the frost had swept through some vineyards but not others was almost biblical. Here’s one example of two parcels, side-by-side. You can see the same buildings in the distance. These pictures were taken a week after the frost on 4 May. One block suffered 100% loss, the other almost no loss at all. St-Emilion, a week after the late April frost. 4 May 2017. Undamaged vines. St-Emilion, a week after the late April frost. 4 May 2017. Badly hit. There were also some really sad views of Saint Emilion vineyards on the other side of town, out towards the border with Pomerol. Although a number of parcels of the famous estates of Figeac and Cheval Blanc were hit, many of their neighbours were punished much more severely. We’ll see very little wine from the Grands Crus Classés in the Corbin sector, for example. Pomerol was also damaged in the lower areas of the appellation but the most famous vineyards up on the plateau fared much better. There should be excellent wines from St-Emilion and Pomerol being shown to the trade and the press next April, while their bereft neighbours look on stoically. 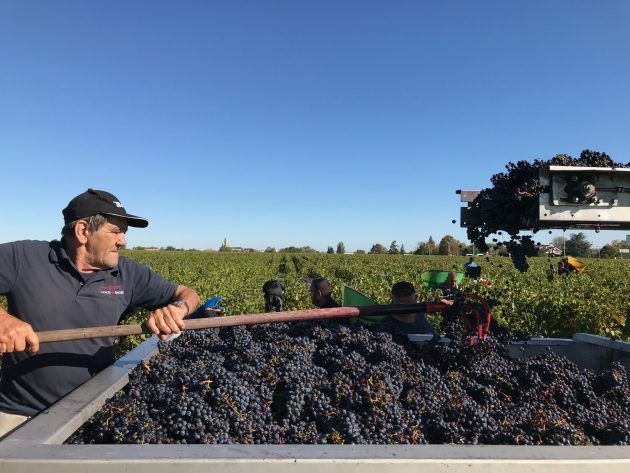 Cabernet Franc harvest at Château Petit Village, Pomerol, 26 September 2017. The less celebrated appellations of the Right Bank, including Lalande de Pomerol, Fronsac and the St-Emilion satellites, took quite a battering in the frost. But harvest conditions were otherwise good for those with vineyards that survived intact. 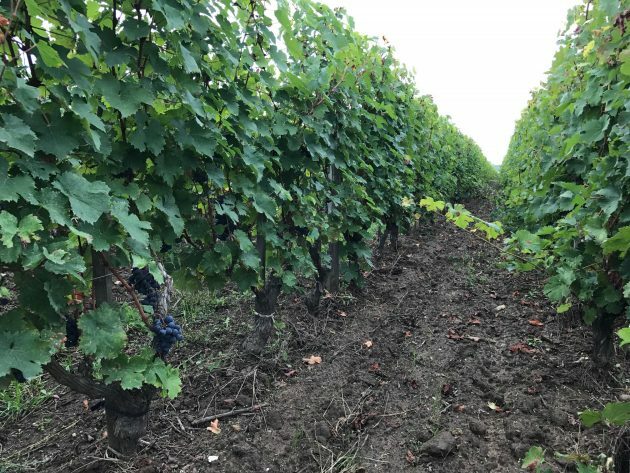 It’s a similar story here and across the Bordeaux: some blocks produced nothing or very little, while the partially hit zones offered up bunches of varying levels of ripeness with the resulting wines showing mixed or debatable qualities; but there’s some terrific quality from plots untouched by the frost. 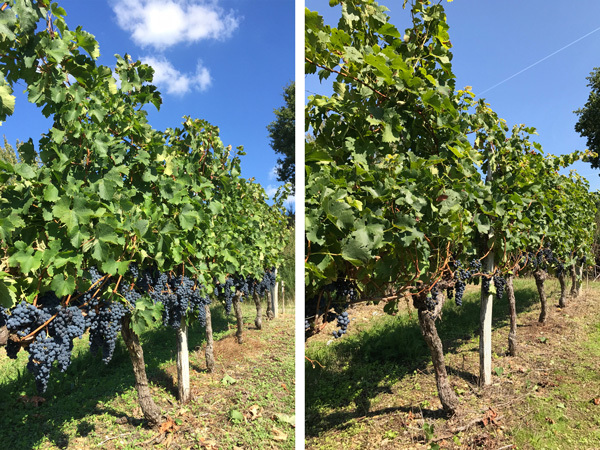 A frost damaged parcel of Merlot at Chateau Bauduc (right) compared to 2016 (left) just before harvest. The engine room of Bordeaux in volume terms, accounting for almost half of production, is generic AOP/AC Bordeaux and Bordeaux Supérieur and this comes mostly from the Entre Deux Mers region and north of Libourne. Then there are the Côtes de Bordeaux reds, with over 10% of the output, plus rosé, Bordeaux blanc, Entre Deux Mers and Crémant, bringing the total of wines with ‘Bordeaux’ on the label up to 70% of the entire Bordeaux appellation. The losses are in line with the general picture of 40%, and quality is, unsurprisingly, extremely variable. 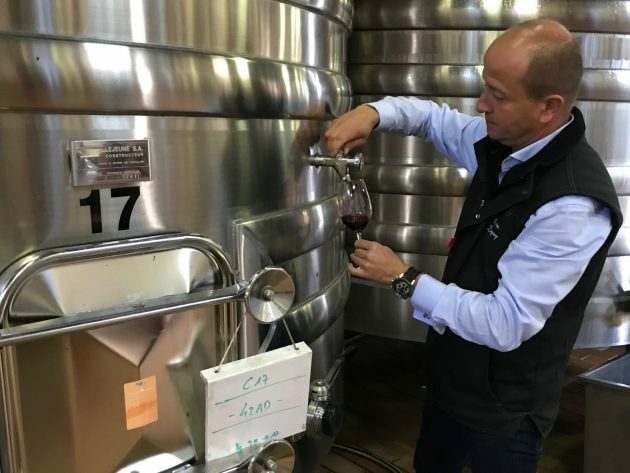 Many producers turned to thermovinification of reds, whereby the must is heated to very high temperatures pre-fermentation in order to eliminate green or vegetal characters, and to end up with a straightforward, supple style of wine for short term drinking. It is, without doubt, a year of mixed fortunes. In Bordeaux, you get used to the qualities of a vintage being described as either homogène – such as in 2010 or 2016 – or hétérogène. 2017 will probably the most hétérogène of the lot. Those who had some parcels that were hit. The second generation bunches that formed after the frost may just have ripened in time for a secondary crop but I can’t see these making anything more than second wines. (We made ours into rosé.) I’ve repeated the word ‘second’ intentionally. Selection is key – not just in the sorting but in the blends for the final wine. One can debate whether pickers know which bunch to pick and which to reject. Those that lost almost everything. The work, though, didn’t stop as growers had to treat their vines with almost equal care, even if just to preserve the following year’s crop. The frost in the early hours of 27 April took out shoots, leaves and tiny unformed bunches. St-Emilion, 4 May 2017. Many people have asked if next year’s crop is affected too. While this was a major concern in May when the severity of the frost damage could be seen close up, most vineyards have recovered sufficiently for there to be adequate growth to prune over the coming winter for the 2018 season. After the frost of 1991, 1992 saw a large crop. The only problem being it wasn’t a very good one. 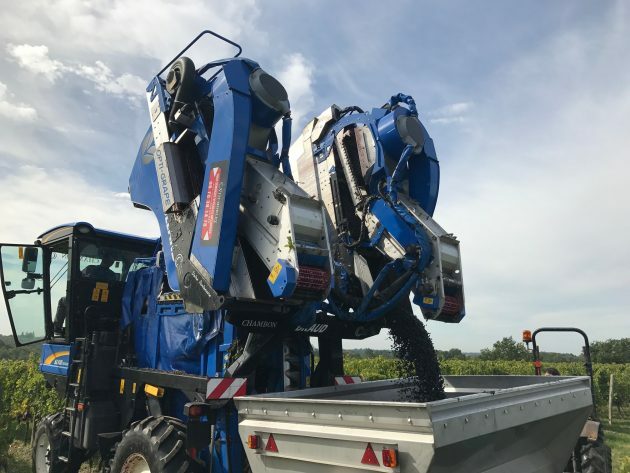 Machine harvester with onboard grape-sorting system. Merlot, Château Bauduc, Bordeaux Supérieur, 28 Sept 2017. Wholesale prices for bulk wines are already up around 20% and demand will outstrip supply for any 2017 bulk wines of quality. 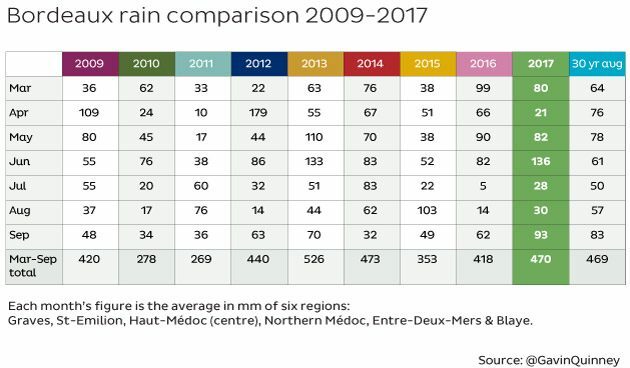 En primeur prices next year for wines from leading châteaux are surely unlikely to follow suit, however, on the back of the chunky increases for the 2015 and 2016 vintages – regardless of critics and the trade being enthused by the wines next Spring. 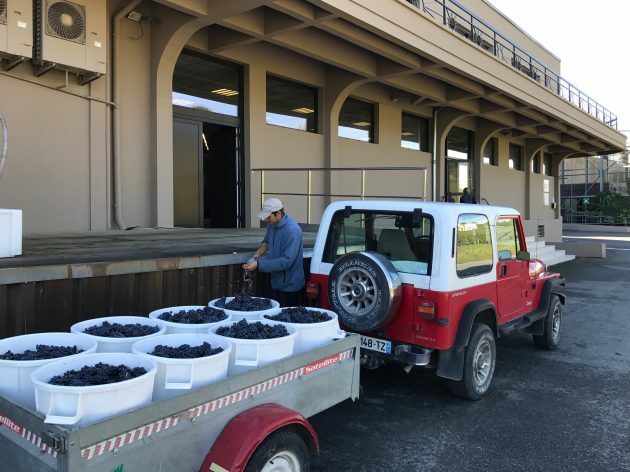 It’s sensible to consider Bordeaux bulk prices – typically around €1.55 a litre, or €1400 a tonneau, for good AC Bordeaux – and the ‘en primeur’ prices for top châteaux as two very different markets. I actually think it will be a fascinating vintage to taste next Spring. Usually the trade and press tastings in Bordeaux take place during the first week of April, but Easter 2018 falls on 1 April. So the Union des Grands Crus en primeur week is set for 9 – 12 April 2018. Here is how 2017 compares to 2016, which is generally accepted as being a great year. 2016 was characterised by a wet spring, then a long, hot, dry summer (12 weeks of almost no rain) before a storm on 13 September brought much needed refreshment to the vines shortly before the harvest. The harvest period was cool, dry and sunny – and a little later than usual. 2017 saw heavy rain at the end of June, then small amounts of intermittent rain during July and August. Almost two weeks of cool, damp weather from the start of September threatened to throw the vintage completely off course, but good weather returned for the last fortnight of the month. Most grapes were picked in September, which is earlier than the norm. As you can see from the activity in the vineyards in the two charts above, 2017 was always ahead of 2016. 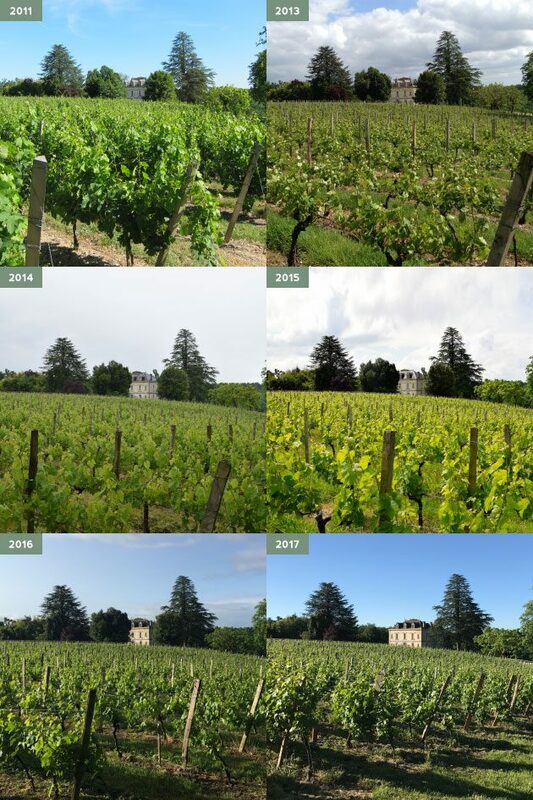 From the pictures of a block of Merlot vines at Château Bauduc below, all taken on the same day on 23 May each year, you can see that 2017 was ahead of all other vintages except the very early year of 2011. 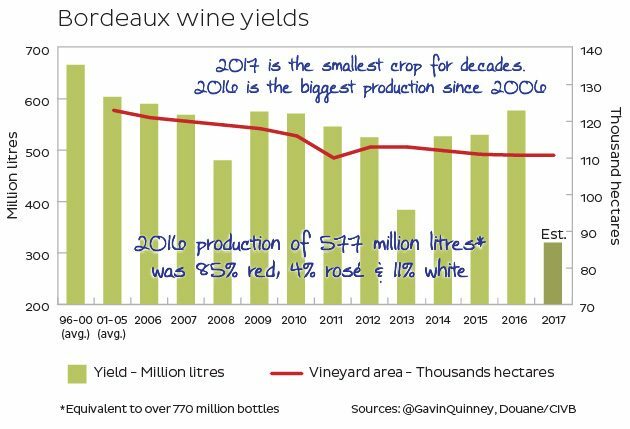 2017 was, in fact, a dry vintage when taking into account the 12-month cycle. Taking the figures from six key regions, we had 712mm of rain for the year, 23% less than the 30 year average of 928mm. There was considerably less rain than the norm in January, February and April. The rainfall was quite consistent from one region to another in 2017. 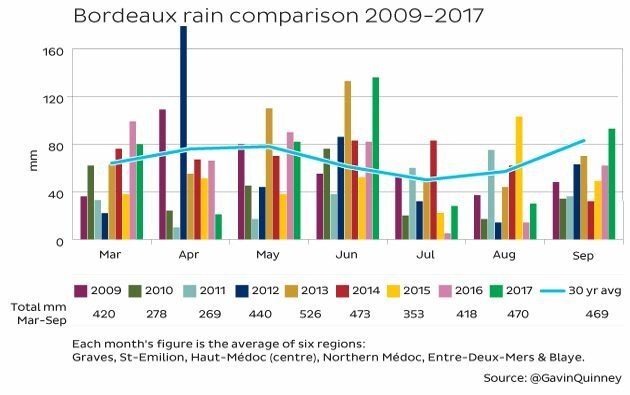 Total rainfall though from March to September 2017 was similar to the 30-year average: June and September were wetter, while July and August were drier. Every recent vintage, barring 2017, has seen a drier September than the average over 30 years.